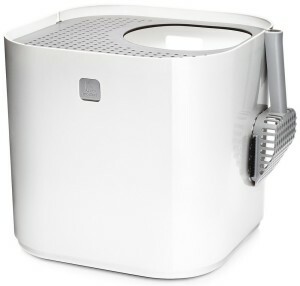 Modkat Top Entry Cat Litter Box Review - Does It Work Well For Cats? 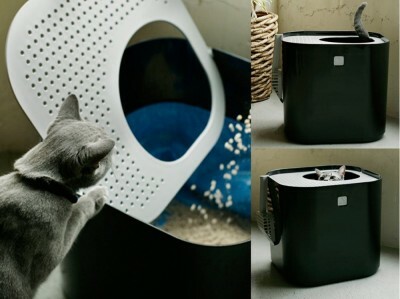 Modkat litter box is a modern and sleek unit that keeps the litter in place with its enclosed design, even with the most determined diggers. Modkat allows cats to have privacy to do their business and keeps dogs from trying to get “treats” inside. 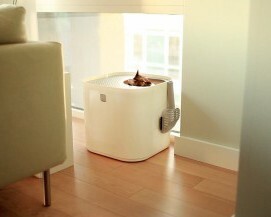 The unit features a “rooftop access” where your cat enters the litter box. This rooftop is a grating lid that helps to remove the litter stuck on the cat’s paws acting as a walk-off mat, keeping residual litter on top of the unit and helping to eliminate the litter tracking. Modkat litter box uses a rip-resistant reusable liner made from strong tarpaulin that will keep you from spending money on disposable liners and will help the environment. Modkat complements any home decor and it’s special for small apartments where you don’t have any choice but place the unit in the living areas. It helps to reduce litter tracking. Grating top lid helps to remove stuck litter on cats paws. Easy to clean with a hinged lid that swings open. 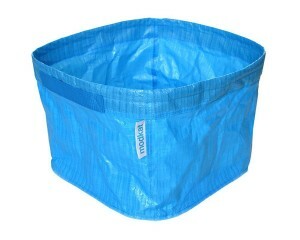 Reusable strong liner with wire frame to fit the litter box. It comes in colors: red, black and white. Dimensions: 16” W x 16” D x 15″ H.
Entry opening: 8.5″ at its smallest point. Can A Large Cat Use The Modkat Litter Box? It depends on the cat. Some customers state that cats weighing from 11 lbs up to 14 lbs use this litter box with no problem. They have to stick their heads out the hole to fit comfortably while using the box (as seen on the image). Cats are very adaptable creatures so very large cats seem to do their business in 2 steps, first doing it, going out the box, then entering again to dig and make sure it’s all covered. Small and average cats might be more comfortable, having more room to turn around while digging. If your cats can share the litter box there is not problem with this unit if kept clean. 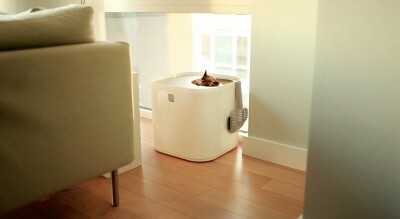 Ideally, it is better to use this litter box and another conventional one upstairs or something like that. When we have only one bathroom at home, we can wait, but usually cats don’t :-). The cat enters through the top hole of the litter box and does its business. The litter area consists of a strong liner with the same shape of the box that fits snugly inside the box by a fitted metal band in the top that keeps it tight against the box walls. The system works good since the liner does not slide down. The liner height is 10” which is about 2/3 of the litter box and it features handles for easy removal and a wire frame that makes it fit snug inside the box. If needed, Modkat can be used without liner as well. When the cat exits the litter box and walks on the grating top it will remove the excess of litter stuck on its paws. Some cats simply jump directly to the floor. This trapped litter on top can be dumped back inside the box by placing the lid vertically at 90° angle since the lid is hinged to swivel open; at this position the lid can be lift straight off the base as well, making it easy to change litter. The scoop goes attached on side of the box for convenient use. Push the tabs located on both sides to release the lid and flip the lid open at 90° angle to leave enough room to scoop. You can remove the lid completely if you want to have more room to do it as well as removing the liner also to scoop if you want. Dump the clumps in a trash bag or use the practical Litter Genie to dispose the waste. The frequency of scooping is the same as a regular litter box. The liner has handles so to remove it, simply lift it up and pour out the dirty litter into a bag or where you dispose the old litter. 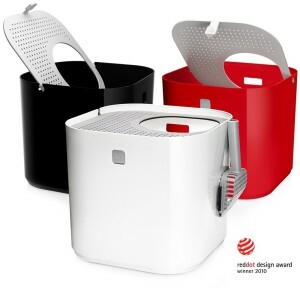 The liner handles allow you to dispose the used litter without getting your hands too close to the waste. The frequency of changing litter is from 2 to 3 weeks. You can hose the box and liner off. 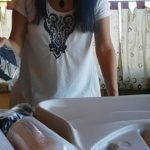 Liners can be washed in the sink as well brushing it and using mild bleach solution. It’s a good idea to keep an extra liner as backup. The box can be washed in the bathtub or similar. Liners are very durable and with one cat and correct usage they have a lifespan of approximately 2 years. What are the Pros and Cons of Modkat Litter Box? Aesthetically modern and sleek design that blends with any room decor. Liner with handles acts as a “portable litter area”, making it easy to carry all the dirty litter close to the garbage or waste container to scoop or to change the litter. Grating top entry reduces litter spillage, catching the excess litter from the cats paws. The litter box is almost all covered (about 60%) by the top lid so you don’t have dirty litter or waste in your view. Good for male cats that don’t squat very much to urinate. Easy to scoop and replace litter. Easy to clean the unit. Convenient storage of scooper on the box side. Brush on the scoop’s side to finishing sweep the top lid. It reduces litter in the box area to about 70% to 95% of a traditional litter box, depending on how many cats use it and how cats exit the litter box (if stepping on top or just jumping directly to the floor). 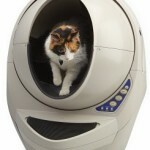 It reduces odors better than a traditional litter box. The litter box does not keep litter from going onto the floor completely. Some cats might stop covering their feces using Modkat. Cats need to do their business in a certain position with their head out the opening entry. Not all cats are willing to use a top-entry litter box. Get an extra liner as backup. Make sure not to fill the liner too high or your cat’s head won’t clear the lid. 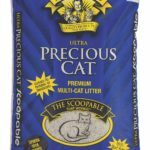 Some customers have recommended litters: Scoop Away, World’s Best Cat Litter, Arm and Hammer Clump litter. Some customers use pine pellets to reduce tracking. Modkat is suitable for cat owners that don’t have any other choice but put the litter box in living areas in people’s view. This is because the unit is very stylish and nicely designed. The unit does not prevent 100% from litter going onto the floor, but it helps a lot, much more than a traditional litter box. 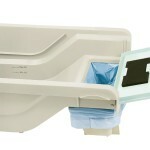 The use of this litter box will reduce the frequency of cleaning the box area. Try to do some testing first to see if your cat will agree in using a top entry litter box. Modkat is a good solution for cat owners that have small apartments or houses and need to place the litter box in areas where it will be seen.